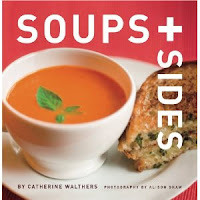 Last week I received a book that is absolutely perfect for me right now: Soups + Sides, written by fellow food writer, Catherine Walthers. I LOVE to make soup. I'll make it year round, but in the late fall and winter, it's a weekly thing. I might do it even more often, but I tend to make lots for leftovers, clever me. In the past, I've anxiously flipped to the soup section in a many a cookbook only to be disappointed by the same old stuff. Soups + Sides is different. I've flagged about 10 soups that I want to make immediately, and the creative side dishes (created to perfectly compliment specific soups) are a fantastic bonus. A not-so-obvious pairing that appealed to me: Celery Root Soup with Roasted Garlic and Red Cabbage Slaw with Oranges and Walnuts. The soup recipes I was drawn to are either fresh and creative (Caramelized Onion-Butternut Squash Soup with Melted Cheese Toasts--it's like a healthier, more satisfying French Onion!) or superlative versions of classics created for home cooks, yet not at all dumbed down, like Chicken Tortilla Soup. It sounds so flavorful, yet not intimidating like chef versions I've seen. The first soup I decided to try was classic tomato. It's the one on the cover, and yes, I made herbed grilled fontina sandwiches to go with it, as suggested. So good, and easy enough that it got me cooking on a day when I was tempted to just throw together a salad. The main change I made was NOT removing some of the seeds from the canned tomatoes, as Walthers suggests. If you'd like to do so, place the tomatoes in a strainer over a bowl to catch the juices. You'll get a slightly smoother, more refined soup. I also decreased the amount of water for a slightly thicker soup, reflected below. Heat the oil in a large pot over medium heat and cook the onion and leek until tender, about 10 minutes. Add garlic and cook 1 minute. Add tomatoes with juices, water, thyme and sugar, and bring to a boil. Reduce and simmer, partially covered, until vegetables are very soft, 10 to 15 minutes. Remove from heat and puree with an immersion blender or in a regular blender, in batches. Stir in cream and taste for seasonings. Since canned tomatoes have a good amount of salt, I only needed to add a bit. Sprinkle with additional thyme leaves if desired. Serve with grilled cheese! I love tomato soup. Your post makes me think about adding leeks and thyme to what is a family favorite.